The Guido family was prominent in the Oakland family. I have several cross links to my Pacheco and de Braga distant cousins. I came across this family tragedy when searching the Oakland Tribune, 29 January 1906, page 7. This is the tragic story of the family of Manoel Guido. 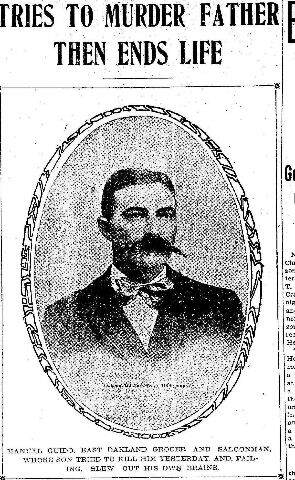 Manuel Guido owned a saloon in Oakland in 1906. His son, Manuel J. Guido, was drunk when he entered the saloon to start work. He began complaining that his family was treating his wrong. Father and son argued. The son fired three shots at his Father. His Father was shot twice, but not seriously wounded. He fled to the basement, brandishing his weapon. 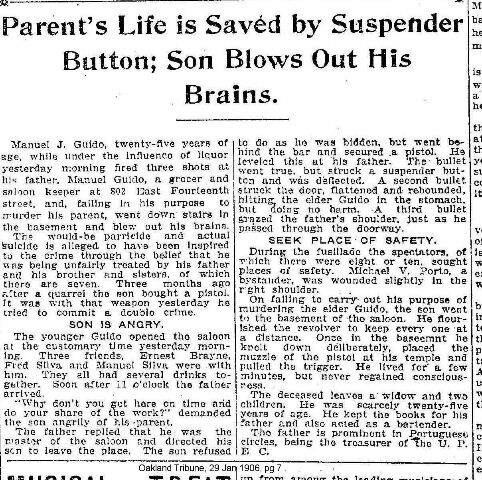 As people looked on in horror, Manuel J. Guido committed suicide by shooting himself in the head. He was 26 years old. Manuel J. Guido was the son of Manoel and Maria Guido. He was the cousin of Manoel Joseph Guido who married by Grandfather’s cousin, Sophie Bonita (daughter of Manoel Bonita and Marie Grace de Braga). I’ve just started researching my Guido family history. It looks like the younger Guido was my great-grandfather. My grandfather was raised by his mother Palmira Silva. His name was Manuel Joseph Guido too. There was a brother Charles. Manuel Guido married Wealthy Balcom and had a child…my father, Manuel George Guido. Dad married Barbara Nickel. I and my brother Gregory Scott Guido are their offspring. Neither Greg or I had children. It’s past the time where we are able. So we are the end of this Guido branch. Carolyn, nice to meet you! My grandfather’s cousin, Sophie Bonita, married Manuel Guido. Manuel was the son Joseph Guido and Louise Riggo. I have some information on this family that I would be happy to share with you!